Emsisoft Emergency Kit for Windows 10 - a set of anti-virus utilities for scanning and treating a computer. The application works without integration into the operating system, contains a number of modules for checking system and user files, uses a command line scanner and quarantine capabilities, uses behavioral and signature analysis methods. The utility supports cloud technologies, uses several anti-virus engines, and is able to detect threats at high speed. The program has an intuitive interface, can generate a detailed report and includes the functionality to identify rootkits. 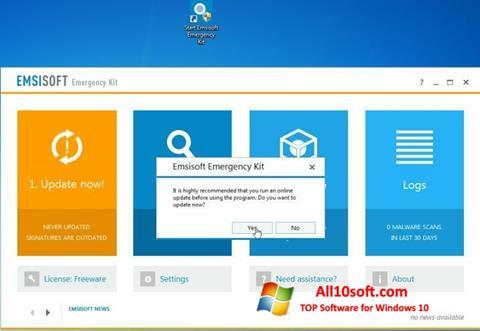 You can free download Emsisoft Emergency Kit official latest version for Windows 10 in English.